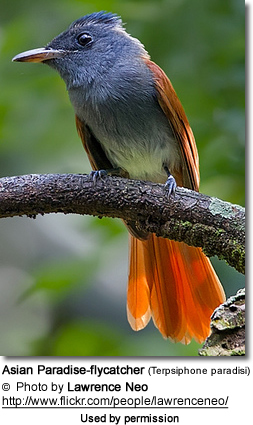 The Asian Paradise Flycatchers (Terpsiphone paradisi) - also known as the Common Paradise Flycatchers - occur naturally in Asia, where they have an extremely large range. Originally, they were only believed to occur in India; however, ornithologists later reported these birds in other Asian countries and - mostly based on differences in plumage of males - identified 14 subspecies and several others are currently being researched, proposed and debated. 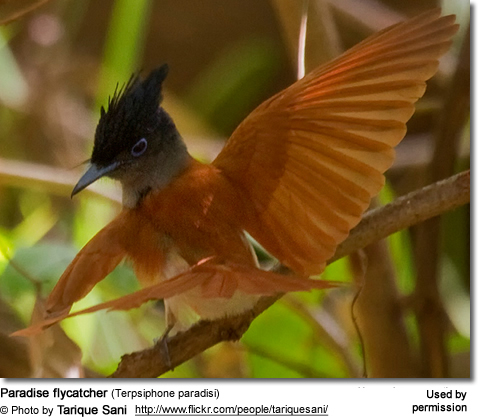 Asian Paradise-flycatchers occur naturally from Turkestan east to Manchuria, and south to India and Sri Lanka and west to the Malay Archipelago where they inhabit the islands of Sumba and Alor (Lesser Sundas). In Singapore, these birds are now regionally extinct. Vagrants have been reported in Korea and the Maldives, where they are rare. Within their range, rufous (chestnut-colored) and white plumaged birds, as well as intermediate forms exist, and their occurrences vary geographically. Rufous-phase birds exist in the extreme southeastern part of their natural range. Intermediate forms occur in India and, to a lesser extent, in China. Intermediates are rare or completely absent elsewhere. Migratory populations travel south to spend the winters in tropical Asia. Both migratory and resident populations exist in southern India and Sri Lanka. They inhabit thick forests and well-wooded areas. The adult Asian Paradise Flycatcher measures about 7.5 - 8.7 inches (19 - 22 cm) in length, not including the long tail, which can grow to 9.4 inches (24 cm) in length, and the male's two central, elongated tail streamers up to 12 inches (30 cm). Their wings are between 3.4 - 3.6 inches (86 – 92 mm) long. Their legs are relatively short, and they tend to sit very upright when perched, similar to shrikes. Males occur in two phases (morphs) - one with a rufous (chestnut) upper plumage (rufous phase or morph) and another with a predominantly white plumage (white phase). The latter doesn't occur in all races. Intermediates of both forms also exist. Some birds also molted from rufous into white plumage . White-Morphs: The body and wings are white. 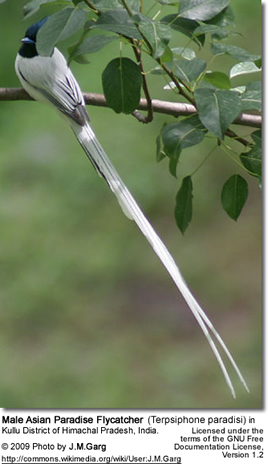 Long-tailed white-plumaged birds have dark shaft streaks (absent in rufous birds). The edges of the wings and tail feathers are sometimes black. Intermediate forms between rufous and white also exist. The eye rings are blue. The long, narrow tail is rounded at the tip, except for the two streamers that droop. The black bill is round and sturdy. Juvenile males lack the two very long central tail feathers, which they acquire in their second or third year. Their bodies and wings are rufous and the head, including the throat, is completely black. Females of all races resemble rufous-phase males, except they have shorter tails (without the streamers) and smaller crests. Their throat and underparts are greyish, and they lack the blue eye rings of the males. 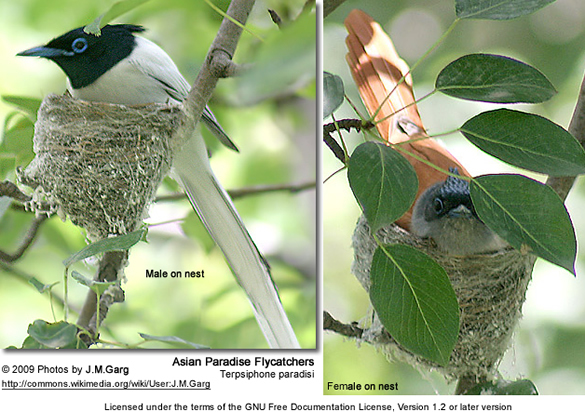 Asian Paradise Flycatchers mostly feed on insects captured in the air. They usually hunt in the understory of densely canopied trees. 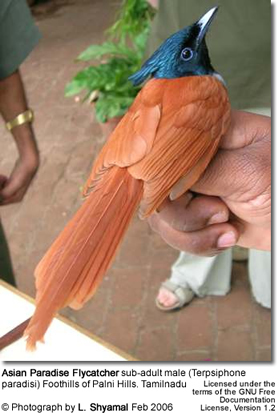 The Asian Paradise Flycatcher mostly breed from May to July. These birds are monogamous and both share the duties of constructing the nest, incubating the eggs, and feeding and protecting the young. A clutch usually consists of 3 - 4 eggs, which are incubated for about 21 - 23 days. The cup nest is made out of twigs bound together with spider webs and is usually situated on the end of a low tree branch. Often, the nest is found close to active drongo nests, which helps to keep predators away from their own nests. 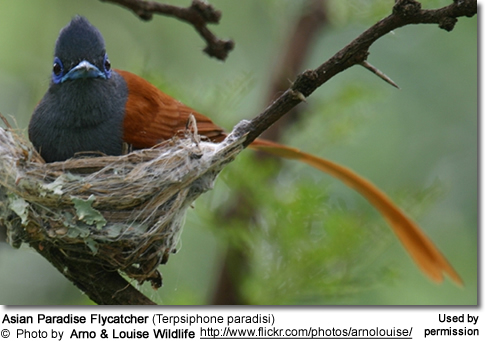 Asian Paradise Flycatchers are quite noisy and their most common calls are described as sharp zweet's. Chinese: ???? ... Czech: Lejskovec rajský ... Danish: Asiatisk Paradismonark ... Dutch: Aziatische Paradijsmonarch ... Finnish: Paratiisimonarkki ... French: Gobemouche de paradis indien, Gobemouche du paradis ... German: Fahlbauch-Paradiesschnäpper, Hainparadiesschnäpper, Indischer Paradiesschnäpper ... Hindi: Val kuruvi ... Indonesian: Burung Sriwang, Seriwang Asia ... Italian: Pigliamosche del Paradiso asiatico ... Japanese: kawarisankouchou ... Lithuanian: Rojaus musinuk? ... Malay: Murai Ekor Gading, Sambar Ekor Panjang ... Norwegian: Gallaparadismonark ... Polish: muchodlawka rajska, muchod?awka rajska ... Russian: ????????? ??????? [?????????????] ????????? ... Slovak: Monarch rajský, vípkar rajský ... Spanish: Monarca Paraíso ... Swedish: Asiatisk paradisflugsnappare ... Thai: ?????????? ?